When it comes to the furniture inhabiting your office building, we’re betting that you are not up late at night worrying over each piece’s condition. While the furniture in your building is probably built to high standards in order to provide years of daily use, constant wear and tear begin to take its toll on every chair, desk, and so on. Each element of furniture holds a specific purpose that serves to enhance and provide support during regular work functions. If your furniture begins to break down, the disruption of workflow and price tag that comes with replacements can cause a serious headache. Hiring professional cleaning services for your corporate building is one easy way to maximize the lifespan of all of your building’s interior elements, from the carpets to the ceiling and beyond. Crystal Clear Enterprises is here to provide unbeatable janitorial services to Kansas City businesses. By focusing on the best technology and janitorial practices, our professional office cleaning crew is able to provide optimal solutions to keep your operations running clean and efficiently. Today, we’ll look at a few furniture tips that may prove useful in the long-term for the longevity of your office furnishings. When you’re ready to benefit from your Top Rated Local® janitorial services, be sure to give us a call! The habitat that your furniture resides in will help to determine its life expectancy. Industry authorities have set the standards, suggesting that your office resides between 60 and 80 degrees Fahrenheit. If you are following OSHA recommendations (68-77°), this should not be a problem. The moisture in your building will also play into the condition of all of your furniture. Striking the right balance between too dry and too moist is an important task for any property manager. When too much moisture reaches your furniture, it can begin to deteriorate and mold. Excess moisture can also create a host of air quality issues in the HVAC system, leading toward system-wide problems such as sick building syndrome (SBS). If the moisture in your office exceeds 60-percent, people and furniture will begin to suffer! The placement of office furniture can also have a big effect on the equipment’s life expectancy. Placing chairs in the sunshine, for example, can cause premature wear and sun damage. Leaving your furniture next to the air vents can create conditional hazards. Remember that small issues can lead to long-term issues due to the heavy use of each furniture piece. If a table is not completely flat and level, for example, daily wear and tear can create premature damages that may be costly or even unsafe in the office. Placing your furniture in safe, secure locations can do much to ensure its longevity. Checking your furniture hardware occasionally can help to prevent untimely breakdowns. One practice that may prove helpful in your office is checking the bolts and screws on office chairs every six months. The same practice can be done for desks, as daily use can place quite the workload on any piece of office furniture. This will help to avoid preventable repairs while also ensuring better safety practices for your building. 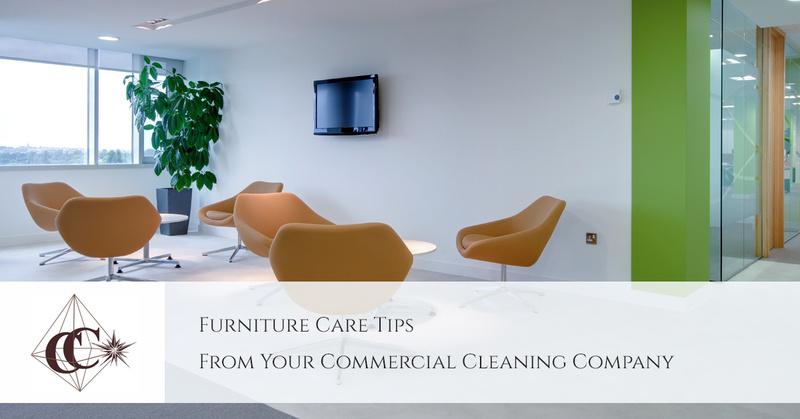 Several factors play into which cleaning style is the best practice for your furniture. The material, for example, will dictate what type of cleaning agent will be used and how it will be applied. It’s important to utilize the right cleaning tools for the job. Any use of harsh chemicals should be approved beforehand in order to avoid any costly or hazardous mistakes. Caring for upholstered furniture can prove even more complicated, necessitating the need to follow care instructions thoroughly. Our commercial cleaning company can be very helpful for this endeavor! Creating the perfect office care plan can be very complex, but it is often well worth the effort. This can be especially true for your office furniture, as poor maintenance measures can equate to costly repairs and unnecessary workplace risks. Those looking for unbeatable janitorial services in Kansas City can benefit from our top-notch commercial cleaning. Our attention to detail and focus on the end result ensures that your office receives optimal services every time we arrive on the scene. Crystal Clear Enterprises offers a wide range of other specialty and carpet cleaning services to provide a one-stop-shop for property managers. Contact us today to learn more about our unbeatable janitorial services! ©2018 Crystal Clear Enterprise, Inc. - Kansas City- Do not copy. All rights reserved.